Three people have died from the H5N1 virus in Indonesia in the past four days. In India, at least three districts are now be infected by the virus, but some experts estimate the virus may be in many more districts and already have reached Calcutta. Birds are dying in greater and greater numbers in Tibet, from the virus and from culling. The death of the 32-year-old man raised Indonesia's human toll to 101 — accounting for nearly half the worldwide total. The man died in the capital Tuesday, three days after being hospitalized. In southwestern Tibet, a poultry farm was quarantined after an outbreak of the disease killed 1,000 birds, agriculture officials reported Wednesday. More than 13,000 other poultry were killed to prevent its spread. In India, the virus spread in three districts of West Bengal state, where culling was under way and more than 129,000 poultry birds have died, said Animal Resource Development Minister Anisur Rahaman. Health workers have killed nearly 2.5 million at-risk birds and were clearing areas within 3 miles of infection sites, said Rahaman. No human infections have been recorded. Skittish officials in neighboring Bangladesh ordered the halt of all egg and poultry imports from India. Bird flu typically flares during the winter months, and a number of Asian nations have recently reported fresh outbreaks in poultry, from India to China to Thailand. Health officials said it was essential that governments step up surveillance to prevent its spread, especially ahead of next week's Lunar New Year, when massive numbers of people and poultry will be on the move. "The more you see it in poultry, the more chance there is that we will see human cases," said Gregory Hartl, World Health Organization spokesman in Geneva. The spread of bird flu through West Bengal has been fast and overwhelming. The truth about what is going on over there is murky, at best. But there are numerous incredible stories coming out of the region. Police are raiding homes to seize birds that owners refused to give up. Poultry believed to be infected with the virus has been eaten at festivals. Roadside store sales of eggs and poultry are booming. There is a general view that the bird flu virus as not as dangerous as international agencies claim it to be. India's borders are now being closed in an attempt to contain the spread. All bad news. India's West Bengal state has since Monday been slaughtering chickens on a "war footing" as bird flu spread to new areas of the highly-populated province of 80 million people. The disease has now been found in 13 of 19 districts in the eastern state, prompting fears it may reach local capital Kolkata which has a population of 13.5 million people. The local government said it could revise the target number of birds to be culled up to three million, of some 20 million fowl counted in the state. "We are worried the H5N1 virus was confirmed in samples from villages just 22 kilometres from Kolkata," West Bengal animal resources development minister Anisur Rahaman said. "If it is required, culling teams will work throughout the night." More than 1.5 million birds have been culled since the outbreak was reported a fortnight ago. New Delhi on Monday tried to calm nerves while the price of poultry products dropped in West Bengal and in some of India's 28 other states, including New Delhi. 950 government-appointed culling teams were working round the clock in West Bengal, where a fourth of its population is in the zone of possible infection. Two states hemming West Bengal sealed their borders with the stricken districts after TV networks in separate reports said the Marxist-ruled province bordering Bangladesh was yet to offer an adequate response to the crisis. In New Delhi, butcheries reported a steep fall in poultry sales, with some establishments warning businesses would take a hit if the situation in West Bengal was not brought under control. West Bengal authorities raided backyard traders at night to avoid resistance from locals who, fearing financial loss, would try to hide the birds or lock up their houses to prevent the chickens from being culled. Poultry owners say they have been devastated by the mass cull, with the government paying only about 40 rupees (one dollar) for each dead chicken, compared with the 80 rupees they could earn on the market, excluding egg sales. The outbreak of H5N1 in West Bengal has shown just how quickly the virus can spread, and how unprepared some governments are to deal with such sudden outbreaks. By all reports, the government of West Bengal is in chaos as H5N1 spreads through dozens of poultry farms and at least six districts. Poultry culls will see more than half a million birds killed within the week, and there are huge problems in getting small farmers to hand over poultry that is not yet sick, as compensation packages are not ready and are not being distributed widely enough. Although the WB government claims there are no human infections, it would be remarkable if there were none, considering some of the emergency poultry culling is being done with bare hands due to a lack of equipment and proper preparation of workers. ....officials say time is of essence in containing the outbreak in Bengal, where the virus seems to be spreading very fast and infecting thousands of birds everyday. A trend that also puts human health at grave risk. Agriculture and food minister Sharad Pawar said on Saturday that "preventive and prophylactic culling" would only be launched in areas which report high and unusual mortality of poultry. "In such a situation, we won't wait for the confirmation of bird flu. Because it is spreading in near-by districts, we have taken a decision that we are not going to wait for Bhopal's report," Pawar said. The state government aims to slaughter 4 lakh birds in a five-to-10 kilometre (three-to-six mile) radius of the affected areas and aims to complete it by Monday, after which clean up and disinfection operations will begin. Agreeing with West Bengal chief minister Buddhadeb Bhattacharjee's reaction, Pawar said the situation "was indeed alarming." Meanwhile, West Bengal's efforts to control the outbreak drew a sharp reaction from minister of state for health Panabaka Laxmi. Reacting to an article...which revealed how compensation was not being paid to farmers whose birds were being culled, she said the Centre is unhappy over the steps taken by the state to contain the virus. "We are not satisfied," she said. She added "compensation to poultry losers was not being properly distributed." Avian flu has been reported in three more districts in eastern India where authorities said poultry farmers have delayed a massive bird cull aimed at halting the spread of the virus. A total of six districts in eastern West Bengal state have reported an outbreak of avian flu among poultry including a new one late Suday, the government said. "Samples of dead chickens in Bankura district tested positive Sunday," West Bengal animal resources minister Anisur Rahaman told AFP. The outbreak is the third in India since 2006, and the worst so far, according to the World Health Organisation, partly because it is more widespread. The state government aims to kill about 400,000 birds in all the affected districts but culling teams have so far slaughtered just 100,000 after facing hostility from villagers. "Police have been asked to accompany the culling teams which is bringing good results," Rahaman said. Residents oppose the slaughter of their birds because they want immediate compensation. Near Margram village -- the epicentre of the outbreak -- the biggest poultry farm with 30,000 birds remained untouched as the owner locked up the premises. Many others fled their homes carrying chickens before the arrival of the culling teams, officials said. Local people attacked five members of a culling team with sticks and stones on Saturday. West Bengal state borders Bangladesh, which is also fighting a bird flu outbreak. The contrast couldn't have been more stark. World Health Organisation officials were covered top to toe in what looked like space suits while a ragtag crowd of barely clothed villagers handled poultry with their bare hands, in the wake of an H5N1 avian flu virus epidemic in some districts of West Bengal. The photographs, more eloquent than words, encapsulate the attitude: Caution and protection for officials, to hell with the rest. Both WHO and government handouts warn of infection risk for those handling poultry without precautionary gear. Even inhaling the air or drinking water in the area contaminated with bird droppings or dust could lead to infection. 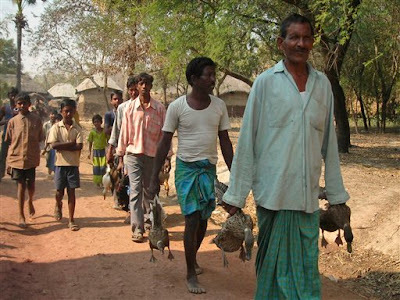 Yet no efforts to protect villagers were evident though over 35,000 birds have already been culled over two days. The slow pace of destroying birds suspected of carrying the deadly virus is also because of reluctance on the part of people to give up their birds without compensation. The delay in paying out compensation to poultry owners is an inexcusable failure of the government. Reluctant to part with the birds without getting compensated first, many are resorting to hiding the birds in closed spaces in their homes. When there was a suspected outbreak of the H5N1 avian flu virus in Maharashtra and Gujarat in 2006, swift action was taken. More than 5,00,000 birds were culled in a mere 24 hours under supervision of the national disaster management cell. What happened this time in West Bengal? Does India Have 700 Bird Flu Patients In Isolation? What sort of madness is this? Are all the family members now under quarantine? How many people did this dying woman come into contact with on her way out of the hospital and on the way home? A 32-year-old Indonesian woman died from bird flu at her home after being forced to check out of a hospital by her family, the Health Ministry said Monday, raising the country's death toll from the disease to 95. Two laboratory tests confirmed she was infected with the H5N1 strain of the virus, said Joko Suyono, an official at the Bird Flu Information Center. The woman from the western outskirts of the capital, Jakarta, came down with severe pneumonia and went to a hospital Wednesday. Her family signed a forced release form the next day and she died an hour after being checked out, Suyono said. It was unclear why her relatives did not want her to be treated at the hospital. Are all the family members now under quarantine? How many people did this dying woman come into contact with on her way out of the hospital and on the way home? A 16-year-old patient suffering from bird flu has been admitted to Persahabatan Hospital in Rawamangun, East Jakarta. The head the hospital's bird flu anticipation division, Mukhtar Ikhsan, said the patient's condition was bad. "The patient has suffered acute pneumonia," he said as quoted by tempointeraktif.com. YF is the first patient treated for bird flu at the hospital this year. The hospital has treated as many as 14 bird flu patients with 12 deaths. So the hospital has a bird flu victim fatality rate of 80%. The public would put themselves at risk because they would not trust politicians to tell the truth if the country was hit by a major outbreak of bird flu, a world expert on disaster management has claimed. Professor David Alexander, of the Robert Gordon University in Aberdeen, has been appointed as an adviser to both Nato and the UK Government on the issue of pandemic flu. Alexander says the country should be preparing itself for a serious outbreak of the potentially devastating virus, but feels that warnings from politicians would not be heeded because of the corrosive impact of bogus claims over Iraq and weapons of mass destruction. Instead he says people would be far more likely to pay attention to experts who are independent of the political process. The director of the Aberdeen Centre for Trauma Research, who led the psychiatric team which responded to the Piper Alpha disaster, said there was a real need to prepare for the worst. "According to the biological scientists a pandemic is likely to strike us. There is no point pretending it won't happen because all the evidence suggests that it will. "We need to be preparing right now. The future has arrived." Alexander says it is critical that, in the event of a major medical incident, the public receive the right message. He said: "You must have credible and competent figures giving out the information. Without naming names, I think it would be fair to say that many people are fairly sceptical about what certain politicians say on major issues, Iraq being one. "We were misled on Iraq. I don't think anybody disputes that now. "Whether the motive was malice or ignorance, I certainly think it has undermined a lot of trust in politicians. There are individuals whose credibility is so low in the public domain that if they came on TV and delivered warnings they simply would not be believed," he said. "Unlike politicians, I believe the public do not view scientists as having any personal vested bias." Economies around the world are already heading towards a recession. A global bird flu pandemic will provide the final push to trigger a new 'Great Depression'. Governments around the world need to do more to prepare for the dramatic economic impact of the next flu pandemic, the United Nations influenza coordinator said on Thursday. David Nabarro said his team had recently collected information from nearly 150 countries to see how prepared they were for a pandemic and the picture was mixed. "Most countries have now focused on pandemic as a potential cause of catastrophe and have done some planning. But the quality of the plans is patchy and too few of them pay attention to economic and social consequences," he told BBC radio. "The economic consequences could be up to $2 trillion -- up to 5 percent of global GDP removed," he said, reiterating previous World Bank and UN estimates. An Egyptian woman died from the H5N1 strain of bird flu on Monday, the health ministry said, the third such death in less than a week as officials and experts warned against the relaxation of precautions. Fardos Mohammed Haddad, 36, from the Nile Delta province of Menufia died in hospital after being admitted on Saturday with a high fever and difficulty breathing, ministry spokesman Abdel Rahman Shahin said in a statement carried by the official MENA news agency. Her death, the second in as many days and the third in less than a week, is the 18th death in Egypt from the disease since the virus first appeared in the country in February 2006. "She had been exposed to poultry infected with bird flu," Shahin said. "All members of her immediate family and people she has been in contact with recently are being tested for the disease."